Tiger's eye is an extremely well-known and popular golden-hued gemstone. Its stability, strength and durability, as well as its eye-catching shimmer, prove it ideal to form into every kind of jewelry and decorative item. As a fundamental part of every rock enthusiast's collection, specimens are sought after by beginners and professionals alike. Beautiful in every light, tiger's eye gemstones are most striking in direct sunlight, where the famous shimmer effect is shown to full advantage. This special characteristic is chatoyancy, a bright reflection in the structure of the stone which causes the appearance of light originating from its interior. So completely does tiger's eye exemplify the effect that it is even obvious in unfinished material. 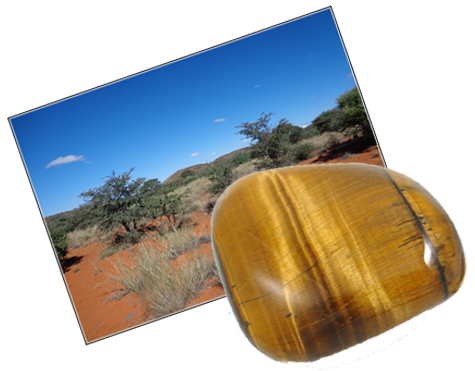 In addition to its famous bright golden color, tiger's eye has various other presentations, creating many unique possibilities for the user. Hawk's eye is the natural blue variety of tiger's eye. Especially beautiful is the flame-like mixture of both, where tiger's eye is intertwined with hawk's eye. Also, the iron mineral hematite frequently co-exists as wavy layers that cut horizontally through the vertical structure of tiger's eye. The name of this combination is scenic tiger's eye; and if yet other minerals such as jasper and limonite are also present, it is called tiger iron. All these varieties, available in different grades, deliver an array of combinations to inspire many artistic opportunities. We produce an abundance of these rough materials and ship them worldwide at reasonable and competitive prices.